is a non-profit educational organization. Visit us online at www.1stWorldLibrary.ORG - Sir Thomas More, son of Sir John More, a justice of the King's Bench, was born in 1478, in Milk Street, in the city of London. After his earlier education at St. Anthony's School, in Threadneedle Street, he was placed, as a boy, in the household of Cardinal John Morton, Archbishop of Canterbury and Lord Chancellor. It was not unusual for persons of wealth or influence and sons of good families to be so established together in a relation of patron and client. The youth wore his patron's livery, and added to his state. The patron used, afterwards, his wealth or influence in helping his young client forward in the world. Cardinal Morton had been in earlier days that Bishop of Ely whom Richard III. sent to the Tower; was busy afterwards in hostility to Richard; and was a chief adviser of Henry VII., who in 1486 made him Archbishop of Canterbury, and nine months afterwards Lord Chancellor. 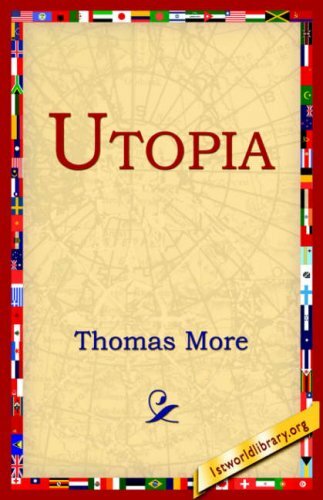 Cardinal Morton - of talk at whose table there are recollections in "Utopia" - delighted in the quick wit of young Thomas More. He once said, "Whoever shall live to try it, shall see this child here waiting at table prove a notable and rare man." At the age of about nineteen, Thomas More was sent to Canterbury College, Oxford, by his patron, where he learnt Greek of the first men who brought Greek studies from Italy to England - William Grocyn and Thomas Linacre. Linacre, a physician, who afterwards took orders, was also the founder of the College of Physicians. In 1499, More left Oxford to study law in London, at Lincoln's Inn, and in the next year Archbishop Morton died.